The news about the prevalence and increased risk of developing diabetes in this country is rather alarming, especially when it involves children and teenagers. The latest statistics from the Centers for Disease Control and Prevention indicate that 215,000 people under the age of 20 have either type 1 or type 2 diabetes, and more than 13,000 youngsters are diagnosed with type 1 diabetes each year. Given these statistics, it’s imperative that children develop healthful eating habits that will last a lifetime. However, convincing kids, especially teenagers, to develop good eating habits can be an uphill battle, and it often involves some trial and error. RDs who work with this age group know that children typically don’t respond to the same tactics used to persuade adults to make necessary dietary modifications. Still, there are many creative strategies nutrition professionals can use to help young clients. 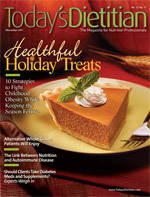 Following are 10 proven approaches developed by two RDs who specialize in diabetes education for children and adolescents and are spokespeople for the American Dietetic Association: Vandana R. Sheth, RD, a certified diabetes educator in Rancho Palos Verdes, Calif., who’s worked with children with diabetes for the past five years, and Marilyn Tanner-Blasiar, MHS, RD, LD, a 20-year veteran in the field who now focuses on diabetes research and prevention at the Washington University School of Medicine in St. Louis. These strategies address four key challenges RDs often face: patient education, disease management, family involvement, and positioning themselves as resources for education and support. Understanding how diabetes impacts the body often reduces fear, anxiety, and confusion among parents and children. One way to do this is using visual tools such as colorful drawings or playing games that explain how the disease works. Tanner-Blasiar kept a jump rope in her office to demonstrate how food pulls blood sugar up and insulin pulls it down. Build a rapport with children and their parents. Sheth suggests RDs ask children what types of foods they enjoy eating, when they eat, and what would they be willing to change in their diet. By identifying and discussing their preferences as well as tweaking their existing diet, they’ll be more willing to listen to you and comply with the necessary changes. Explain to children and teens that they need to eat three meals per day along with two snacks to get the proper balance of carbohydrates and protein. Offer meal suggestions and guidelines on how many calories, carbs, and protein they need to consume with each meal and what to do if they feel weak or tired. Act out realistic scenarios children may encounter at school or when socializing with friends, Sheth says. Give suggestions on what to do if a friend offers them a cookie or piece of candy, and discuss how these snacks will make them feel if they eat them. Can they split a pizza with their friends on Friday night? Can they have cake and ice cream at a friend’s birthday party? Clearly define their limitations and the potential consequences of eating unhealthful foods, and arm them with a list of snacks they can carry with them whenever they’re visiting family or friends. Sheth routinely e-mails parents or sends text messages to teenage clients about new foods she discovers in the grocery store or interesting magazine articles on diabetes she comes across. Some teenagers come to her office for more in-depth educational sessions. Referring to a book she keeps in her office, Sheth says she and her young clients look up different items available at fast-food restaurants and check the carb content of each one. “There are always choices,” she tells them, explaining that they can still go out with their friends for a hamburger and diet soda, but they’ll need to skip the fries. Aim to teach parents and children how to read food labels, and encourage moms and dads to take their children grocery shopping so they choose healthful foods they’d like to eat. By allowing kids to make healthful food selections, Sheth says they’ll be more inclined to eat them. This experience also will help children choose healthful foods in the school lunchroom and at restaurants. Since regular exercise can help control diabetes and reduce the risk of developing long-term complications, Sheth suggests that families take brisk walks around the neighborhood after dinner or incorporate physical activity on weekends or during vacations. They also can give each family member a pedometer to encourage friendly competitions, Sheth says. For example, everyone can compete to determine which family member walks the most in one day or week. In addition to walking, parents can play a quick game of tag, basketball, or baseball with their children in their backyard or at a park. Introduce kids and teens to their peers who have diabetes. Tanner-Blasiar says her coworker does this so the kids have a friend they can talk to, e-mail, and rely on for support. It makes a huge difference.